The Copy COP Orders Into BOMP application allows the user to import orders for Feature Items entered in Customer Order Processing. Copied orders are automatically converted into production orders and may be sent through the production process as if they had been entered in Production Order Entry. Once copied, an order from COP may be viewed via the Production Order Entry application but may not be changed. 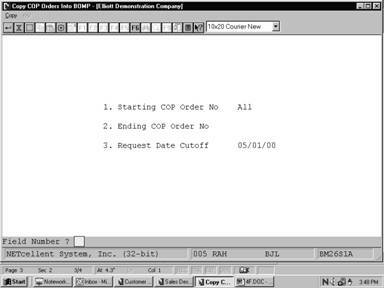 Until a work order has been printed or production has been reported, an order may still be changed or deleted in COP. For more information on production of feature items see Feature Item Processing in this manual's Package Overview section. When they are copied, COP orders will be assigned the next sequential production order number. The COP order number, as well as the customer's name and number will be retained for reference on the generated BOMP production order. A report listing the details of all copied orders will be created automatically when the application is run. Note: COP Orders copied into BOMP must be new orders (ie. may not be selected for invoicing, etc.). The Quantity On Order field for the feature item will be the only Item File inventory level affected because COP automatically allocates controlled components when orders are entered. Select the desired mode from the Copy COP Orders Into BOMP menu bar. Enter the starting COP order number for the range of orders to be copied. Defaults to All. Enter the ending COP order number for the range of orders to be copied. Defaults to the starting order number. Enter the cutoff date for the range of orders to be copied. Only COP orders with request dates (set in the COP Order Entry application) on or before this date will be copied. Entry is required.